Held in March of 1938, the ceremony was delayed a week because of flooding in Los Angeles. This was the first time that the ceremony was postponed. Two other ceremonies were also delayed - in the years 1968 and 1981. This was the last year for the short-lived awards category of Best Assistant Director (won by Robert D. Webb for In Old Chicago), and also the last year for the three-year long category of Best Dance Direction (won by Hermes Pan for "Fun House" in George Stevens' A Damsel in Distress). This year was the only one in which a Marx Brothers film received a competitive Oscar nomination -- for Dave Gould's Best Dance Direction for the song/dance number "All God's Children Got Rhythm," in A Day at the Races. 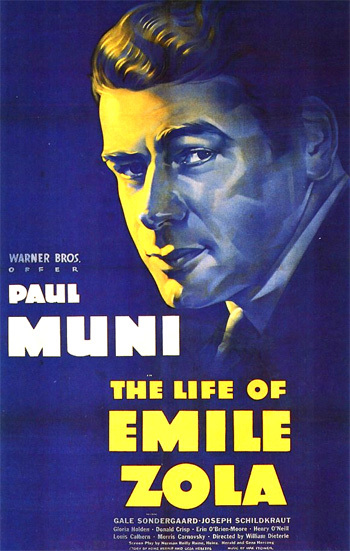 Following the Best Picture success a year earlier with the film biography The Story of Louis Pasteur (1936), Warner Bros. studio, director William Dieterle, and actor Paul Muni teamed up for the 'prestige picture' The Life of Emile Zola and succeeded - it was the studio's first Best Picture award - the studio was already well-known for its trademark, socially-conscious biopic films. Dieterle earned his first (and only) nomination as Best Director for the picture. The Best Picture winner was a well-crafted screen biography about Emile Zola, the brilliant, crusading 19th century French literary novelist who fought to defend army officer Captain Alfred Dreyfus from an unjust, anti-Semitic accusation of treason (and exile to the infamous French penal colony Devil's Island) in the late 1800s. The film won three awards from its ten nominations: Best Picture, Best Supporting Actor, and Best Screenplay. Another excellent Best Picture nominee for 1937 was a film with six nominations and only one win - Best Director for Leo McCarey. The film was the classic screwball tale based on Arthur Richman's play, The Awful Truth - a sophisticated comedy about a married couple (the first on-screen pairing of Cary Grant and Irene Dunne) that separates in a courtroom but then discovers they are made for each other at the last minute. [Only a handful of actors/actresses have won two consecutive acting awards: Luise Rainer for The Great Ziegfeld (1936) and The Good Earth (1937); Spencer Tracy for Captains Courageous (1937) and Boys Town (1938); Katharine Hepburn for Guess Who's Coming to Dinner (1967) and The Lion in Winter (1968); Jason Robards for Best Supporting Actor for All the President's Men (1976) and Julia (1977); and Tom Hanks for Philadelphia (1993) and Forrest Gump (1994).] With her two wins, Luise Rainer beat out talented Irene Dunne who was nominated for two of her most memorable comedic roles, Theodora Goes Wild (1936) and The Awful Truth. Silent film entrepreneur and Keystone Kops originator Mack Sennett was honored with a Special Award for "his lasting contribution to the comedy technique of the screen...that master of fun, discoverer of stars, sympathetic, kindly, understanding comedy genius." A second Special Award was presented to Edgar Bergen for his outstanding comedy creation, puppet Charlie McCarthy. 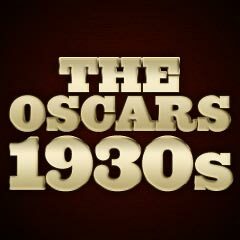 Disney won another Short Subject: Cartoon Oscar for The Old Mill - his sixth (consecutive) win in the category. Paul Muni starred not only in the Best Picture winner, but also in The Good Earth as Rainer's husband - the last film supervised by legendary producer Irving Thalberg of MGM Studios. Thalberg's death prompted the establishment of a new category beginning in 1937: the Thalberg Award was first given to 20th Century Fox's Darryl Zanuck. If the Academy had instituted the Special Effects Oscar in 1937 (it didn't exist until 1939), The Good Earth would have won for its spectacular swarm of locusts plague, or In Old Chicago would have been honored for its spectacular 20-minute re-creation of the 1871 Chicago fire, or the destructive hurricane in The Hurricane would have been recognized as worthy of an award. Strangely, director Victor Fleming of Captains Courageous was passed over for a Best Director nomination. One of Laurel and Hardy's classic comedies, Way Out West, was nominated for only one category: Best Score, and lost. Every major contributor to Best Picture nominee The Awful Truth was recognized (Irene Dunne for Best Actress, Ralph Bellamy for Best Supporting Actor, and Leo McCarey for Best Director and Screenplay) but the comedy film's male lead, Cary Grant, was not nominated for Best Actor - a significant example of the Academy's shunning of comic performances. [Grant was twice nominated for his dramatic performances for Penny Serenade (1941) and None But the Lonely Heart (1944).] When presented the award, McCarey remarked: "Thanks, but you gave it to me for the wrong picture" - he was referring to the Academy's complete neglect of his other 1937 film Make Way For Tomorrow. The last year for the Best Dance Direction Award (established in 1935) was again given to someone other than nominee Busby Berkeley (for "The Finale Number" in WB's Varsity Show). Instead, it was presented to Hermes Pan for the "Fun House" number in RKO's A Damsel in Distress. One of the year's worst awards was in the Best Song category - the award was presented to Harry Owens' song "Sweet Leilani" from Paramount's Bing Crosby musical Waikiki Wedding over the superior and more sophisticated "They Can't Take That Away From Me" (sung by Fred Astaire), written by George and Ira Gershwin in RKO's Shall We Dance. And one of Walt Disney's masterpieces, the first full-length feature cartoon Snow White And The Seven Dwarfs was nominated for only one award, Best Score - and it lost! It would have been a great choice for Best Picture. Both Ginger Rogers and Katharine Hepburn were overlooked for their performances in Stage Door, and Carole Lombard was not nominated for her role as small-town girl Hazel Flagg, who faked that she was dying of radium poisoning and became the toast of the town in Manhattan, in director William Wellman's screwball comedy Nothing Sacred. Looking back, it is also remarkable to note that MGM's classic Camille, directed by George Cukor, one of the greatest romantic tearjerkers in all film history, received only one nomination - Best Actress which Garbo lost - and was not nominated for Best Picture, when the film easily surpassed two other Best Picture nominees: In Old Chicago and One Hundred Men and a Girl.